Today, as we celebrate Mandela Day and the 100th birthday of a legendary leader and global advocate, I think back on a very special Mandela Day where Africa Teen Geeks was born. While attending school at MIT, I was shocked that only 5% of schools in Africa teach ICT, increasing just slightly to 10-12% at affluent primary schools. Nearly all high schoolers never had a chance to learn basic programs such as Microsoft Word. At the same time parts of Africa were becoming hotbeds for technology. For example, many would be surprised to know that Elon Musk was educated in South Africa. In this moment, I believed that we could create home-grown tech talent in Africa. From our first Africa Teen Geeks class in 2014, today we have eliminated barriers in STEM for 42,000 students from disadvantaged backgrounds through classes, clubs, mentorships and hackathons. In South Africa and around the world, companies, nonprofits, and governments are coming together to change the landscape for STEM. However, we must pique the interest of our future talent early, especially females. Progress I believe lies in thinking creatively, outside the norm and letting down our preconceptions about what is possible. For example, teenagers as a channel to solve social and criminal justice challenges? Fast forward to last week where Africa Teen Geeks held the #Hackathon4Justice at the Symantec Mountain View Headquarters in partnership with the United Nations Office on Drugs and Crime (UNODC) and Africa Teen Geeks. The hackathon was the final round of competition for winners of three regional hackathons that took place in South Africa, Indonesia and Bolivia earlier in the year. Following these contests, 25 secondary school students were selected from amongst the three countries as winners and invited to travel to Symantec for the final hackathon. Students were tasked with developing educational games to teach peers about criminal justice and law issues. Members of UNODC, South Africa government representatives, Symantec executives including Chief Human Resources Officer Amy Cappellanti-Wolf, chaperones and mentors were all in attendance. The excitement, passion, creativity and expertise of these students wowed everyone in the room. For example, winning team ‘Wakanda Vibes’ created “Silent Scream,” an application that combines a trivia game with the ability to report human trafficking crimes as a victim or as a witness. The trivia game includes scenarios for youth on how to learn about and behave in potential human trafficking crimes. Additionally, who would imagine a grandmother’s knitting skills could be key to helping those without computers learn how to code? 90% of people in Africa, and just under 40% of the global population, are without access to computer or the internet. How can we teach coding to this population? In 2016, I created Knit2Code, a program of Africa Teen Geeks. What they have found is that the same logical thinking required for coding is also required for knitting. Additionally, it reinforces connections between generations of women, encouraging them to see themselves, and their expertise in knitting, as an agent of change to teach this 21st century skill. I came from a small village, famous for one of the largest game reserves in Africa. I was raised by my grandfather alongside 11 siblings and cousins all under the age of 16. My grandfather always told us that education is the key to a future different from our past. While earning the equivalent of $8USD a month, he opened up every door possible to ensure learning was something we loved. In fact, he himself went back to school at nights to learn how to read. Today Africa Teen Geeks is Africa’s largest computer science nonprofit, and I am proud at this very moment to be speaking at Marie Claire’s first Power Summit, alongside the Nelson Mandela Foundation. When many of the students come to our organization they see their future career as a truck driver, a soccer or music star. They haven’t even considered a career in technology. And often they have no mentor or example to follow. When they leave, many are ready to be the next Bill Gates, the next Mark Zuckerberg. Mentorship is a powerful tool. 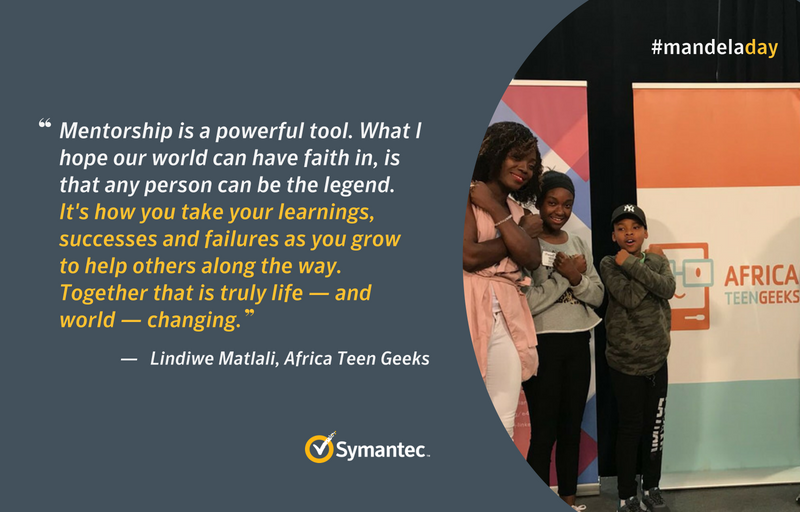 From my grandfather to Symantec’s Eileen Brewer who I met during the TechWomen program, mentorship is why I am here today as the leader of Africa Teen Geeks. What I hope our world can have faith in, is that any person can be the legacy. It’s how you take your learnings, successes, and failures as you grow to help others along the way. Together that is truly life-and world-changing.